It’s not every High School girl’s dream to give up her Sweet 16th birthday gifts to benefit others. But that’s exactly what sophomore Dana McKinney at Revere High School did. McKinney, who has been giving her birthday gifts to others for four years now, was touched by the story of Findley CLC students at the Love Akron Breakfast this past September. And it was then that she decided to give them a sweet surprise. On December 19th she passed out gift bags to all 500 of the children at Findley. Though Love Akron is off to a wonderful start with their Findley Community Learning Center (CLC) Project, they’ve realized it is going to take an enormous amount of effort in many different areas to make this a success. It truly will take a village, or community, to touch these children’s lives. To realize their dreams and create a model that works and can be of lasting impact, it needs to create change in measurable ways. Though the task ahead is great, they aren’t backing down when it comes to the future of the kids at Findley. Have you ever imagined what it would look like if members of the community stepped in and made a meaningful difference in our schools? A beautiful transformation could occur, as portrayed in the documentary “Undivided”. 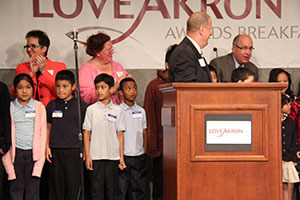 This past September, Love Akron held a special breakfast, sharing clips of “Undivided”. It captivated many hearts while introducing them to an inner city school in Oregon, transformed by the love of their community. Here is our first story to give the broad overview from a Community Focus Group’s point of view. We started with Community Health. Several groups work together to address broad health concerns for Summit County, including the Summit County Health Department, Austen Bio-Innovation Institute of Akron (ABIA), and others in the areas where they specialize. We didn’t know what we would find. We quickly learned that diabetes is one of the largest health concerns in our area that is not very adequately addressed (as you will see in the following story). It is amazing that something that seems so common could be such a big problem. Diabetes in Summit County is a very big issue and we as a community are very far from having an adequate response to it. Therefore the story didn’t take the shape we hoped it would. But, as one of my philosophy professors used to say, “It is better to know than not to know.” So, even though no one we could find has yet imagined a comprehensive response to diabetes in our community, here is the overview of what we know. 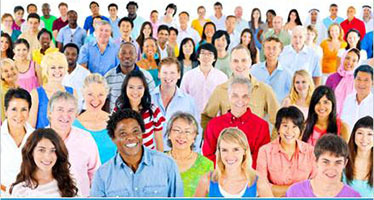 Everyone is affected by diabetes in one way or another. If you don’t have it, maybe a loved one or friend does. Whether you suffer from diabetes, or a loved one does, it is a life-changing disease. From the dietary and lifestyle changes it demands to the mental toll it takes, it’s not easy to deal with.